The ZSU-23-4 "Shilka" is a rank VI Soviet anti-aircraft vehicle with a battle rating of 8.0 (AB/RB/SB). It was introduced in Update 1.63 "Desert Hunters". The "Shilka" presents a much higher rate of fire than its predecessor ZSU-57-2 and allows the user to saturate the airspace to increase the chance of hitting a low-flying aircraft. The Shilka preforms more or less like a roided up Wirbelwind, minus the tank hunting ability. As such, the fewer the planes that know your location the better. If one is headed your direction, let them get as close as possible (within reasonable safety, of course) before opening up, to guarantee a hit. The few props and lower rank jets that occur at top rank are easy pickings at most distances due to the wide spread of the 23mm river, but 9.0 jets are trickier to hit, even at medium ranges, so the more of an element of surprise you have, the better. Suspension wheels are 20 mm thick while tracks are 15 mm thick. Belly armour is 9.4 mm thick. 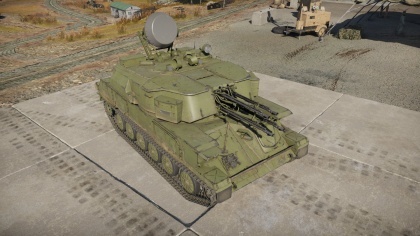 The ZSU-23-4 is equipped with a 1RL33 search and tracking radar, mounted on top of the turret, at the rear. The radar system lacks track while scan, but can track targets in a full 360° area around the turret (instead of just to the front of the turret). The radar has very slow scan speed. By default the radar will scan a 60° arc, this can be changed to a 360° scan if desired, using the "change radar search mode" key. The ZSU-23-4 should be played entirely as an AA vehicle. Do not go tank hunting in this vehicle, as you do not have the armour or the penetration. Focus on keeping the skies clear, something that this vehicle does very well. A high rate of fire and very fast turret traverse means that you should be able to target and destroy even the fastest jets. 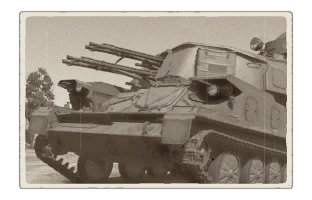 You have a high ammo count with this vehicle, meaning that you can afford to find a good spot away from the main fight in order to pick off enemy planes. Unless you need to reload your ammo, avoid spawn points. They are usually the hub of most of the fighting and going to them will put you in the firing line. While it is fully enclosed, the ZSU-23-4 has armour which makes the M18 Hellcat look like a heavy tank. Even 7.62mm machine guns stand a fair chance of penetrating this vehicle. This makes you a primary target for aircraft, which at this vehicles BR are usually armed with cannons or high penetration machine guns, which will easily take you out. Top rank helicopters and the FJ-4B VMF 232 are the greatest threat to your existence. They are both capable of sitting comfortably outside your firing range while firing lethal ATGMs at you. Hide from them until they are either dealt with by an allied plane or they come close enough to be dealt with by your 23mms. Radar-assisted fire control; a lead indicator is shown in Realistic. Low penetration for 23mm cannons means you will have trouble penetrating certain MBTs from the side. The main Soviet self-propelled anti-aircraft vehicle ZSU-57-2, in service since 1955, did not perform satisfactory due to the lack of radar tracking, low rate of fire, and small ammo count for its high-power auto cannons. Its firepower was supplemented by the ZPU and ZU series of anti-aircraft mounts using the 14.5 mm and 23 mm armaments respectively. The ZPU and ZU were towed or truck-mounted and had a high rate of fire, but suffered from low mobility when not on a truck and lack of protection if mounted on a truck for a mobile role. It became desirable to combine the traits of these two type of anti-aircraft weaponry together for a tracked anti-aircraft vehicle to be protected, have good mobility, contain a good amount of ammo, and deliver a high rate of fire with heavy-hitting caliber. Development started in 1957 for this vehicle, ready to be evaluated in 1962. The vehicle went under the name ZSU-23-4 "Shilka", named after the Shilka River in South-Eastern Russia. The first set of digits signifies the caliber, 23 mm, and the second signifies the number of cannons, 4. Equipped with four water-cooled 23 mm auto cannons, the ZSU-23-4 is aimed via manual optics or with a radar that can track aircraft up to 6 km away and guide the armaments to a estimated coordinate. The vehicle can carry up to 2,000 rounds of 23 mm ammunition and each cannon has a fire rate of between 850-1000 rpm. The ZSU-23-4 was built on a GM-575 chassis, which itself is based off the PT-76. It was accepted for service by the Soviet Army in 1965 and proceeded to replace all the ZSU-57-2 still in stock by the 1970s. From the time period 1964 to 1982, up to 6,500 ZSU-23-4 were produced at the Mytishchi Engineering Works. The Soviet Army used the ZSU-23-4 as their main anti-aircraft defense weapon. It was intended that the ZSU-23-4 only guard military bases and mechanized formations while the ZSU-37-2, a side development during the Shilka's development period, guard the low-altitude area unable to be hit by surface-to-air missiles. However, the ZSU-23-4 Shilka eventually replaced it to keep a logistics simple. From Soviet doctrine, the Shilkas were organized in anti-aircraft artillery batteries with two platoons of four vehicles each. Initially, one platoon was filled with ZSU-57-2's and the other with Shilkas, but the ZSU-57's were replaced in service by the Shilkas in the 1970s. In the 1970s, the batteries were also reorganized to one platoon of Shilkas and one platoon of anti-air missile systems, both meant to supplement the dead zone from the divisional surface-to-air missile systems. The Shilkas, being very lightly armoured, mainly stay behind the main forces and the front line, ranging between 400 to 1,000 meters away from the fighting. Though each Shilka unit fought with their own radar system initially, the implementation of the PPRU-1 allowed for coordinated targeting between the Shilka and missile units against enemy aircraft. Despite their intended role as an anti-aircraft, the high rate of fire, heavy caliber, and ability to elevate the guns at a high angle made it a very popular ground support weapon. This utility made it a very useful weapon in the Soviet occupation of Afghanistan, being able to fight the Mujaheddin ambushing from mountainous terrain. The Soviets also used it during the War against Chechnya, fighting the Chechens in the mountains. The ZSU-23-4 still sees use in the Russian Naval Infantry. The ZSU-23-4 saw more usage in the hands of the Soviet Union's allies. 2,500 of the Shilkas produced were given out to up to 23 nations. It's most infamous records would come from the hands of the Arabs in the Yom Kippur War in 1973. Using the SA-6 surface-to-air missiles, they forced the Israeli planes to fly low to avoid missile detection and then blasted them away with the Shilkas. The Shilkas also saw use in the later part of the Vietnam War, where they are used nearly the same way by attacking aircraft forced low by missiles. Past that, the ZSU-23-4 saw usage in multiple conflicts in the Third World countries and are still in use today in the Syrian Civil War. Skins and camouflages for the ZSU-23-4 from live.warthunder.com. This page was last edited on 24 April 2019, at 16:09.